ASMA: Do you think social media has changed the way academia operated earlier? 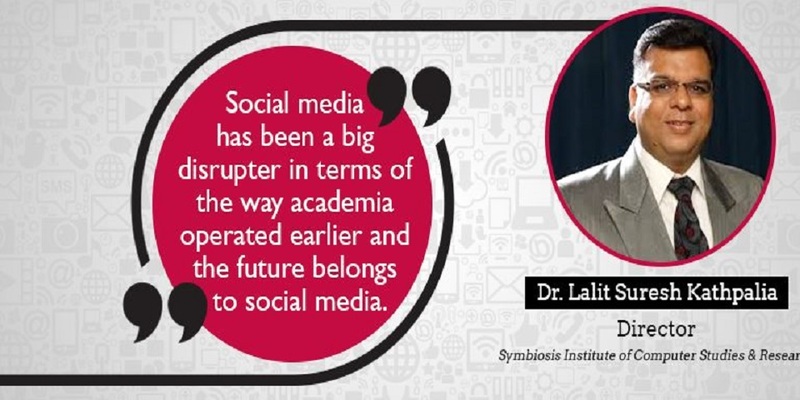 Dr. Lalit Kathpalia: I think social media has made a drastic impact in the way academia is operating. I remember the time when we had a problem in terms of the fact that we could not advertise due to the large rates or the large prices charged by print media and I think digital media and social media made a positive impact to the fact that academia could go out and tell their programs and also interact or engage with the audience directly. That I think has been a very positive change. When it comes to selling of the programs, engagement with students of the future and that would not have been possible without social media. The other thing which has happened is that you have to understand that the students of today are digital native, so they are also very familiar with the modern technology and they would love to have academia interact with them in the means in which they comprehend stuff. One difference that it has made to me when we looked at digital or social media is the fact that many people feel shy to talk to teachers or to the directors of the institute, but if they are their friend on social media then it makes a change. He / she would like to chat with you and still feel comfortable despite the fact that it’s not a face to face conversion. So I would say that social media has been a big disrupter in terms of the way in which academia operated and I would say that the future belongs to social media. I would say that until now there are some limited ways in which social media has been used in academia and it will keep on increasing combined with the fact that we also have mobiles, cloud and analytics coming. ASMA: What would be the level of impact according to you has happened on academia by social media? Dr. Lalit Kathpalia: The level of impact is very high and social media is a disruptor and there is a big change in the way people learn and if we know how to use social media rightly, you will find that social media coupled with digital and elearning makes learning an enjoyable experience. If you look at the books which are being offered you have groups coming in to solve the problem, experiences, and hence the impact of social media is phenomenal. It also brings in the level of connectedness, engagement and social media has changed academia and in the future there would always be people who’ll believe that academia cannot run without social media. ASMA: What are the different facets where your organization uses social media? What are the different platforms? Dr. Lalit Kathpalia: We use social media for a lot of things, we use for marketing of our programs, get feedbacks about our curriculum, to improve our programs as we are open to feedback and we try and understand where we stand in terms of what industry needs and how do we groom up students. We also use social media for placements from LinkedIn wherein we can connect with the world. Social media also plays an important aspect in student’s lifestyle starting from admissions to placements to alumni, even attendance in some cases. The biggest benefit of social media is branding of an institute. My viewpoint is that branding is an essential part of an institute because despite what one does, you have to brand yourself and that’s where social media plays an important role. ASMA: What kind of pedagogical improvements social media has caused in your organization? Dr. Lalit Kathpalia: The pedagogical improvements at the institute are at a nascent stage. We try to experiment with the curriculum delivery using a learning management system called a ‘Moodle’ and we provide extension to social media on Moodle, we have Facebook group of batches , we use Twitter to teach a topic and record attendance and we ask students to write Twitter stories through tweets to explain a topic, we also use blogging to give students assignments to understand what they’ve understood and the other part is that we use Wikipedia where we have built up our own page where we can get our SICSR Wikipedia These are things that we’re doing on a pedagogical level using social media. ASMA: What are the different modes where the teaching learning process which use social media at SICSR? Dr. Lalit Kathpalia: We primarily use social media for blogging pieces and to some extent in terms of engagement with the students. ASMA: Are there any qualified and dedicated teams for managing social media atSICSR? Dr. Lalit Kathpalia: We have a group of people who manage social media but at the same time we also engage through digital media agencies for managing social media for SICSR because we don’t have sufficient bandwidth to do it as a full-time activity. This is primarily used for branding and advertising on digital media. We have our Facebook, LinkedIn, Twitter accounts where some portions are managed on our own but some have been outsourced to digital agency. ASMA: What are the important aspects of calculating ROI on social media investment in an academic organization? Dr. Lalit Kathpalia: The most important aspect of calculating ROI on social media investment is the number of registrations for admissions. For e.g. if I talk about my BBIT course, I would earlier have got say 2000 registrations but now due to the branding by social media the ROI is clearly visible and registrations have nearly doubled or have increased to a 100%. So that’s the biggest way to calculate ROI. ASMA: Which are the domains where social media is playing a crucial role in success of an organization which has admissions, placements, alumni, teaching, learning etc? Dr. Lalit Kathpalia: Admissions coupled with marketing is one of the biggest areas in which we’ve had the most impact happening. Placement team started using LinkedIn and other properties for social media and they also are benefitting and alumni is also using social media as a connect mechanism and also coupling it back for seeking help from alumni for placements. So for admissions, placements and alumni, admissions has received the highest impact, placements has also received a moderate impact and alumni has got a good impact where we’ve connected batches which we were not able to do. As far as teaching learning is concerned, we’ve take baby steps and we’re yet to improve on that. ASMA: What are your views on traditional marketing initiatives VS social media marketing initiatives and how the balancing between the two is done at your institute? Dr. Lalit Kathpalia: Traditional marketing initiatives are dead, primarily because the reach is not as much as compared with social media; secondly the cost of traditional marketing initiatives is so prohibitive that to market academic programs is a challenge for an institute and specifically for universities. We do not have a lot of money to spend on traditional media, so traditional marketing initiatives are definitely dying. Social media marketing initiatives is gaining an upper hand. While for traditional marketing activities you don’t even know whether your message is received, what is the perception of the message and what will in translate into in terms of returns, so considering these things social media in the future would primarily be the most emerging platform for all industries. ASMA: What would your suggestions be for the academic institutes for adopting social media tools? Dr. Lalit Kathpalia: I would say that academic institutes need to be on the forefront to adopt social media tools. I am a firm believer that social media tools are primarily technology, and any academic institute who is on the forefront of using these tools will tend to be branded better, will be seen as an innovator, and will be seen as a leader of using social media. As a Director of SICSR, I am proud to say that we’ve been very keenly using social media tools and social media can make or break an academic institute and in the near future, we would always like to be on the forefront and I would like to advise everyone to experiment and use social media. Though there are some risks involved such as negative feedback, but at the same time, life is all about taking risks, so why not social media?